Solid form screening and selection is an integral part of drug development. Traditionally, it has focused on the search for a crystalline form, such as salts and polymorphs.1-5 In recent years, it has been expanded to include co-crystals and amorphous solid dispersion (ASD) screens for poorly soluble compounds. Solid forms with different properties can be used to overcome various development challenges, such as solubility, stability, or manufacturability. However, in the early phases of drug development, medicinal chemists and formulators must work together to balance cost, timelines, and quality. 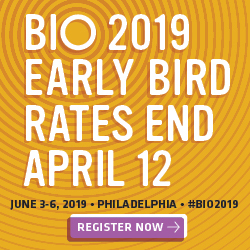 The pressure to keep costs down in the early phases, combined with the need to quickly progress development and the high attrition rate of candidates, has led to an increased interest in a phase-appropriate strategy for solid form screening for small molecule candidates. A phase-appropriate approach is an iterative process, with screening activities becoming more comprehensive as resources become available and technical requirements change. During early development, limited screens are focused on finding a suitable solid form to enable a rapid progression to the next milestone. While later in development, after the clinical proof-of-concept, more material and resources become available, and comprehensive screens may be performed to find all solid forms for intellectual property protection, and identification of the optimal solid form for commercialization. Poor solubility is a growing issue in drug development, which often leads to unoptimized drugs or increased development timelines.6,7 Utilizing solid form screening to identify a more soluble form, eg, salt or ASD, is a key step for improving the bioavailability and the molecule’s chance of success.1-3,8 For certain molecules, a more soluble solid form can enable preclinical and clinical studies without the use of more advanced enabling formulation technologies. Throughout the past decade, screening technologies with automated sample preparation and integrated analyses have been developed to support the discovery and evaluation of different solid forms.9,10 These technologies require smaller amounts of material, take less time, and enable the solid form studies to be applied at earlier stages, eg, when comparing pharmacokinetics (PK) of multiple compounds during lead optimization.2 The following describes a rational, fit-for-purpose strategy for solid form screening and selection to ensure a successful yet cost-effective progression of drug candidates from discovery, clinical trials, and commercialization. It also discusses key considerations and highlights how solid form selection can impact cost, timelines, and product quality. 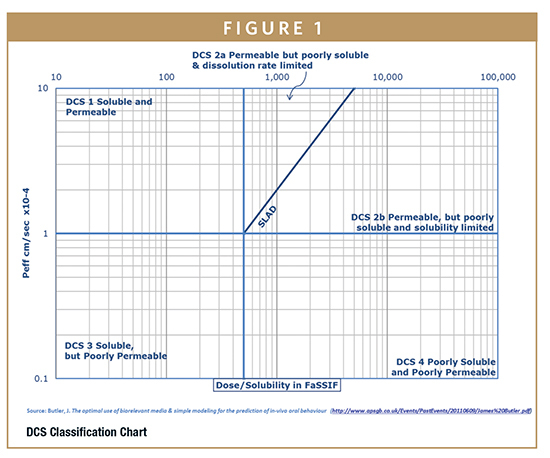 More than 90% of small molecule drug candidates are poorly soluble and belong to DCS 2 (2a and 2b) or 4 (Figure 1). Challenges with poorly soluble compounds include non-linear dose proportionality, variable pharmacokinetic profiles (inter-species and inter-subject), and limited toxicological coverage. All of these may compromise human dosing prediction and studies. For these molecules, solid-form screening and bioavailability-enhancing formulations are required to achieve the desired toxicological coverage, and uniform exposure in different animal species and humans. Crystallization is the most widely used technique to isolate and purify the API at a large scale. This is especially critical for high volume and low margin products for which the API is a major contributor to the overall cost of goods. It is therefore essential to identify a suitable crystalline form of an API to ensure it can be manufactured on a large commercial scale even if a crystalline form is not required for formulation. During candidate selection, identification of a developable crystalline form can facilitate isolation and purification of the drug substance, ensure the supply of drug substance with consistent and desired physical properties, and simplify development of formulations that support preclinical and clinical studies. Crystallization screening can be conducted using small amounts of materials (~100 mg), and should explore a variety of solvents (polarity, H-bonding donor and acceptor) and crystallization conditions, such as temperature and cooling rate. If the molecule has an ionizable group for salt formation, the crystallization of the free form can be done as part of a salt screening. For example, Eli Lilly’s Zyprexa® (olanzapine), indicated for schizophrenia, was developed with several delivery methods using the free as well as different salt forms in order to achieve the necessary pharmacokinetic profiles. The drug maker developed an orally disintegrating tablet version using Catalent’s Zydis® fast-dissolve technology platform that can be taken without water; a combination product using the hydrochloric salt; and an extended-release injectable suspension using the poorly soluble pamoate salt, which allows the molecule to dissolve slowly over several weeks. If salt formation is feasible for a poorly soluble compound, a salt screening should be conducted. A salt with adequate solubility and stability will help reduce PK variations (dose-to-dose, inter-subject, and inter-species), increase exposure and toxicological coverage, and enable simple formulations, such as powder in bottle (PiB), powder in capsule (PiC), and suspensions to be used in preclinical and clinical studies. Salt screening for poorly soluble compounds may be focused on the discovery of more soluble salts with small, hydrophilic counter-ions, such as acetate, methanesulfonate, and citrate. It is important to recognize that salt solubility alone may not be a reliable surrogate for bioavailability. Dissolution and precipitation kinetics and PK studies may be required to select the best salt (vide infra). Co-crystal screening is similar to salt screening in many aspects. However, co-crystal formation depends primarily on the H-bonding and other molecular interactions between the API and co-former, which are weaker than the ionic interactions for salts. An effective co-crystal screening relies on both in-depth understanding of structure-property relationship, solubility of both API and co-former, and specialized screening methods, such as solvent-drop grinding (SDG) and thermal methods. However, the lack of knowledge and effective screening technologies limit its use, especially for early stage development. It is important to recognize that some co-crystals are relatively easy to discover, to produce on a large scale, and to formulate into drug products similar to salts. Most co-crystals, however, will require significant development of a co-crystallization process for large-scale manufacturing, stability assessment, and evaluation of biopharmaceutical characteristics in formulated products. As shown by Entresto and other approved co-crystal drugs, this can be rewarding for otherwise difficult or intractable compounds. As understanding and screening technologies become more efficient, co-crystals will undoubtedly become a more important tool for drug development. Polymorphs are crystals that have different arrangements and/or confirmations of the molecules in the crystal lattice. As such, they have different physico-chemical properties, such as solubility, stability, and bulk density and flow properties. It is important to conduct polymorph screening to identify different polymorphs, hydrates, and solvates, and to determine their thermodynamic relationship. And most importantly, one must determine the most suitable, and typically most stable, polymorph near ambient temperature for development. Polymorph screening is generally required based on the International Conference on Harmonisation (ICH) guidelines and for the chemistry, manufacturing, and controls (CMC) section of a regulatory filing. Polymorph screening ensures that the API and drug product manufacturing processes are robust and that the drug product is stable, efficacious, and safe for patients. It is critical to conduct a polymorph screening of the selected free form or salt to identify the various polymorphs that may be encountered during API isolation and formulation so the optimal polymorph is selected, made, and formulated to support preclinical and clinical studies. Otherwise, switching to a different polymorphic form at a later stage will likely require additional process development, reformulation, and possibly bridging toxicology and PK studies, which can result in significant delays and increased costs. An effective polymorph screening technique should explore a variety of parameters that may influence nucleation and growth kinetics of different crystalline forms. These include a diverse set of solvents and mixtures, aqueous mixtures of different water activities, and different crystallization modes, such as slurry ripening, rapid and slow cooling and evaporative crystallization, solvent and anti-solvent additions, and temperature. It is also important to include experiments to assess the process-induced polymorph transformation, such as API micronization, wet granulation, tableting, and formation of new solvate with excipients.17 For comprehensive screening during the later stage, one should also use the final route material and different forms, including amorphous material for screening studies. High-risk compounds will require special formulations that may include amorphous solid dispersions for poorly soluble compounds. An amorphous dispersion screen is performed to find a suitable amorphous dispersion that exhibits acceptable properties, typically higher solubility to improve the exposure. The solubility enhancement of an amorphous solid compared to crystalline form typically varies from approximately 2 to 1,000 folds, depending on the lattice energy of the crystalline form and H-bonding donors and acceptors of the molecule.18 Further enhancement can be achieved for ASD with polymers and surfactants, which may also inhibit precipitation and re-crystallization of a supersaturated solutions. ASD can be prepared using different techniques, such as fast evaporation, freeze-drying (FD) or spray drying (SD) of solutions, or hot melt extrusion (HME). Some of these can be conducted with small amounts of material in the laboratory. SD and HME can be scaled up to large scale for commercialization. The screening performed in early development may focus on parameters such as API solubility screening in organic solvents suitable for SD, API miscibility screening with polymers and surfactants to determine the drug loading, followed by preparation of ASD. ASD should be characterized by polarized light microscopy, Xray powder diffraction, differential scanning calorimetry, thermogravimetric analysis, dissolution profiles, and accelerated stability assessment. The promising ones should be tested in animal PK studies. Every drug candidate is unique, and solid-form strategies and requirements vary over the course of drug development. Table 1 outlines how solid form studies are typically aligned to achieve specific development objectives at different stages of development. During the early stages, the focus is identifying a suitable crystalline form to support isolation and purification of an API and to provide drug substance with adequate solubility and stability for preclinical and clinical studies. 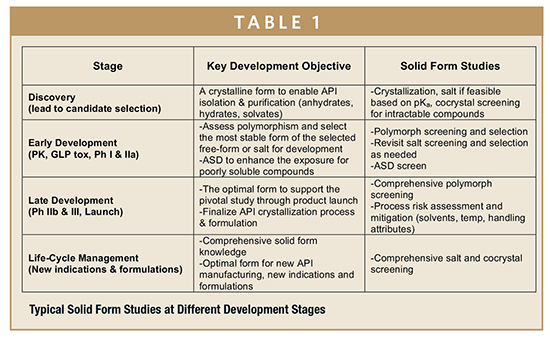 As development progresses, additional studies are conducted in later stages to assess and discharge the solid form risks during the API and drug product manufacturing processes, to increase the understanding of the solid form, as well as maximize opportunities via the selection of the optimal solid form for new indications and formulations. Typically, in product development, there is a separation between drug discovery (medicinal chemistry) and drug development (formulation), and the transition between them is not as smooth and efficient as it could be. During lead optimization, medicinal chemists are charged with producing a molecule with best selectivity and in vitro potency. They are not typically thinking about how the drug will be dosed to animals and patients, and whether their choices are in alignment with the formulation and dosage form technologies that may be needed. This focus on in vitro potency can lead to selection of candidate molecules with poor physico-chemical and biopharmaceutical properties. The solid form of an API can have a profound impact on physical properties and nearly all drug development activities. The process outlined in this discussion takes into consideration the fundamental physico-chemical properties of a molecule, the impact of different solid forms on API purification, physical properties, and formulation strategies. It can be used to develop an appropriate selection strategy to ensure a rapid and successful progression of small molecule drug candidates. Finally, it is important to recognize that finding a soluble solid form or formulation to improve the solubility and dissolution of a candidate is only half of the solution. The other half is to determine doses and dosing strategies in order to avoid precipitation before drug absorption occurs, a subject which is beyond the scope of this article. 1. Stahl PH, Wermuth CG. 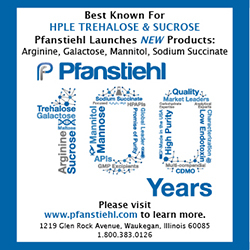 Handbook of Pharmaceutical Salts – Properties, Selection, and Use. Wiley-VCH, 2002, and references therein. 2. Huang L-F, et al. Impact of solid state properties on developability assessment of drug candidates. Adv Drug Delivery Rev. 2004;56:321-334. 3. Ku MS. Salt and polymorph selection strategy based on the biopharmaceutical classification system for early development. Am Pharm Rev. 2010:22-29. 4. Davies G. Changing the salt, changing the drug. Pharm J. 2001;266:322-323. 5. Byrn S, et al. Pharmaceutical solids: a strategic approach to regulatory considerations. Pharm Res. 1995;12:945-954. 6. Leeson PD. Molecular inflation, attrition and the rule of five. Adv Drug Deliv Rev. 2016;101:22-33. 7. Hann MM, Keseru GM. Finding the sweet spot: the role of nature and nurture in medicinal chemistry. Nat Rev Drug Discov. 2012;11:355-365. 8. Chemburkar SR, et al. Dealing with the impact of ritonavir polymorphs on the late states of bulk drug process development. Org Process Res Dev. 2000;4:413-417. 9. Morisette S, Almarsson O, Peterson M, et al. High-throughput crystallizaiton: polymorphs, salts, cocrystals and solvates of pharmaceutical solids. Adv Drug Delivery Rev. 2004;56:275-300. 10. Igo D, Chen P. Vibrational Spectroscopy of Solid-state Forms – Applications and Examples. In: Pivonka D, Chalmers J, Griffiths P, eds. Applications of Vibrational Spectroscopy in Pharmaceutical Research and Development. Hoboken, NJ: J. Wiley and Sons, Inc. 2007:293-308. 11. Lindenmayer JP. Long-acting injectable antipsychotics: focus on olanzapine pamoate. Neuropsych Dis Treatment. 2010;6:261-267. 12. Amidon GL, et al. A theoretical basis for a biopharmaceutic drug classification: the correlation of in vitro drug product dissolution and in vivo bioavailability. Pharm Res. 1995;12:413-420. 13. Serajuddin AT. Salt formation to improve drug solubility. Adv Drug Deliv Rev. 2007;59:603-616. 14. Sun CC. Cocrystallization for successful drug delivery. Expert Opin Drug Deliv. 2013;10:201-213. 15. Babu NJ, Nangia A. Solubility advantages of amorphous drugs and pharmaceutical cocrystals. Cryst Growth Des. 2011;11:2662-2679. 16. Bysouth SR, Bis JA, Igo D. Cocrystallization via planetary milling: enhancing throughput of solid-state screening methods. Int J Pharm. 2011;411:169-171. 18. Yu L. Polymorphism in Molecular Solids: An Extraordinary System of Red, Orange, and Yellow Crystals. Acc Chem Res. 2010;43:1257-1266. Dr. Pingyun (P.Y.) Chen is Director of Early Development at Catalent Pharma Solutions. He began his career in pharmaceuticals in 1999 as a research investigator in pharmaceutical development at GlaxoWellcome. After spending 1 year as a principal research scientist at Eli Lilly in 2004, he returned to GlaxoSmithKline to co-lead the solid-form sciences team to provide global salt and polymorph screening and selection support for drug candidates from discovery through commercialization. He joined Catalent Pharma Solutions as Manager of OptiForm® technologies in 2010. 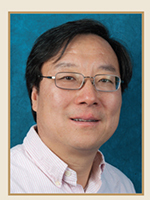 Dr. Chen has delivered multiple presentations as an invited speaker in scientific conferences and co-authored more than 40 publications and book chapters. He is named as a coinventor on multiple patents.